We all love a bit of Luke Shaw. The young left-back is currently in the form of his life. Fresh off a new contract, the ex-Southampton man has brought a new lease of life to a position in which we struggled in last term. 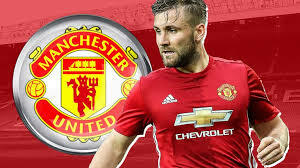 Shaw has given Jose Mourinho one less problem to worry about, and now, it looks as though he’s feeling more comfortable with life at Old Trafford. Now I’m unsure as to whether the tweet is about himself or the man who is in the photo with him, Anthony Martial… Shaw has signed a new deal while making a career comeback, but I’d like to think that he’s urging his French counterpart to do exactly the same. The pair have that left-side of the field on lock at the moment. They’ve arguably been our best, most consistent performers from the first whistle on opening day against Leicester City. The fact that they’re now sharing a joke and whatnot further shows what an excellent working relationship they share.